A month ago I wrote about my first commission in a post titled "Mick's Dogs". There is more to the story! When I delivered the watercolor of Mick's three dogs to him he was thrilled. The piece was a gift for his wife. As we chatted at the coffee shop, which I painted in my July 5th post "Plein Air Painting", Mick said he had another project for me. I was anxious to hear what it was since the dog portrait went well. Mick wanted a portrait of himself. 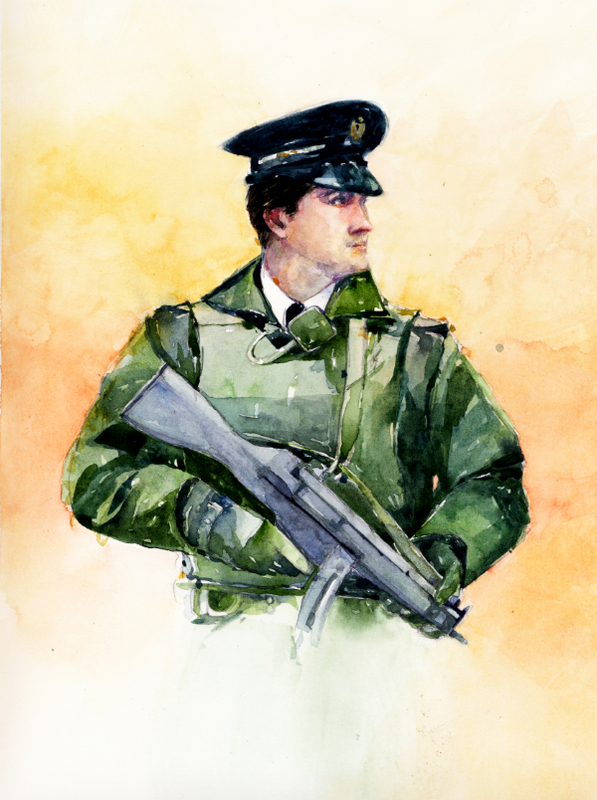 Not a current portrait, but one of himself when he was in the Irish Army many years ago. He didn't really have a photo for reference. He emailed a YouTube video titled Royal Ulster Constabulary - A Tribute and said he wanted me to use the uniform and weapon shown at a certain minute mark in the video. Mick also sent a few old photos of himself (which weren't quite that old) so I could insert his face on the proper uniform. I was nervous since I hadn't done a personal portrait and this was going to be difficult. I put it off. I had a workshop coming up with Alvaro Castagnet and thought maybe I would learn some secret formula from him to help with this commission. I put it off longer since I had another workshop coming up where I surly would learn something to give me confidence to try the portrait. Neither workshop was about portrait painting. I finally plunged in after Mick asked several times about it. It took a couple weeks to finish. I painted smallish areas, let them dry, and came back with more color and value while trying to have some of my own style show. I was happy with it finally and hoped it looked like a much younger Mick and that the weapon was correct. Thankfully Mick was pleased and said it did look like him and the weapon was right. Great news! 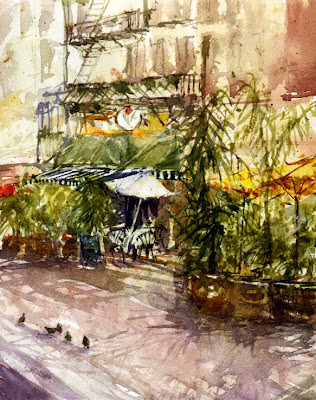 St. Vincent's Court in downtown Los Angeles was our exciting location for the Saturday paint-out. It's located between Broadway and Hill on 7th Street. It began as Saint Vincent's College in the 1800's and is now a California Registered Historical Landmark. From my younger years, I remember it being an alley for deliveries for the Bullock's department store there. It is much more charming now with its many ethnic cafes. 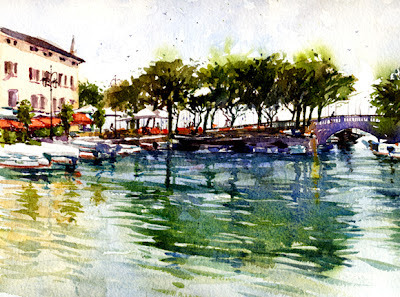 A great place for plein air painting with many interesting views. One of the problems I've had with my plein air painting experience since starting a few months ago has been trying to leave out a lot of what I see. I've ruined several paintings with too many brushstrokes, putting in too many tree branches, etc. I've tried to learn from my unsuccessful attempts. 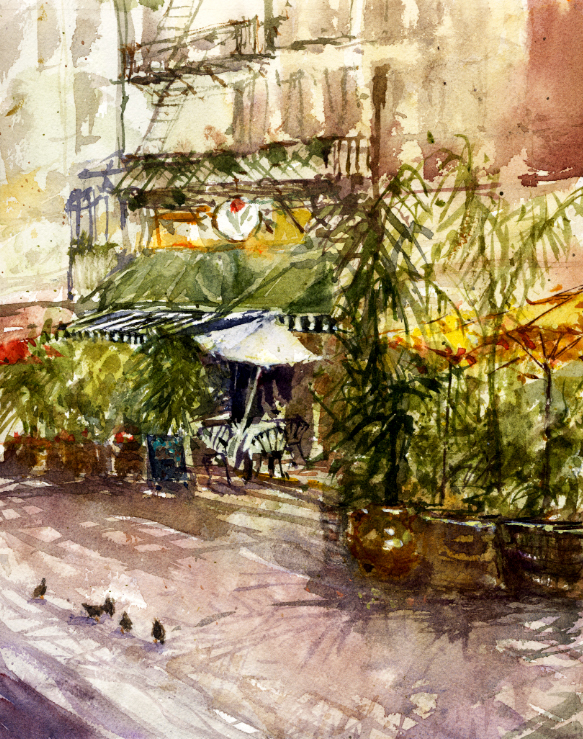 So, there I was choosing a view to paint which included potted palms, tables, chairs, patterned umbrellas, shadows, fire escapes, windows, striped awnings, all on a patterned brick street. Maybe a recipe for disaster but I was inspired. I had fun chatting with the shoe shine man I was sitting next to. Here is my painting and a photo of my view. I'm also posting a photo from my painting spot looking in the opposite direction with even more going on. I thought about it. Maybe I'll try that view next time. These photos were taken in the morning when the cafes were setting up to open. 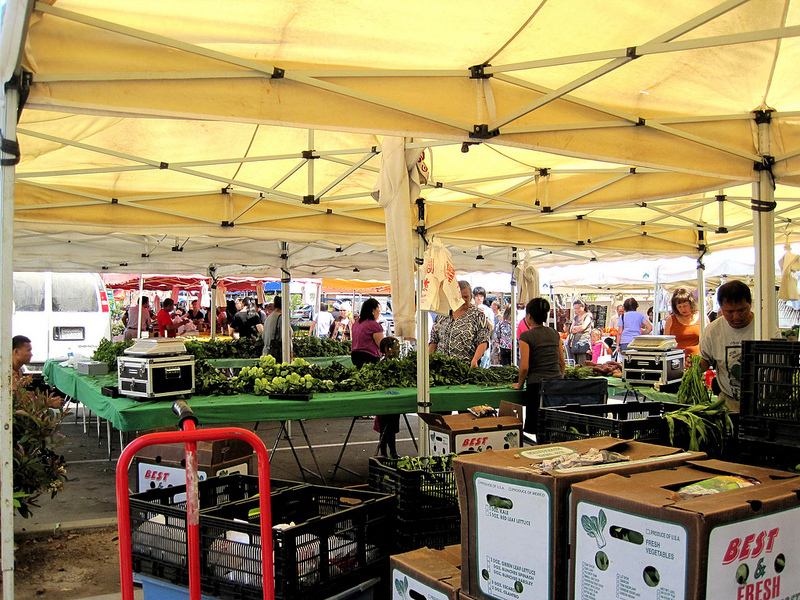 Do you love farmer's markets? I do, and we just returned from the Thursday South Pasadena market. I get overwhelmed with all the wonderful produce choices. I also love to take photos of all the colorful activity and unusual views. I've painted two watercolors of farmer's markets that I'll share today. I'm also posting a few favorite market photos that might inspire future paintings. 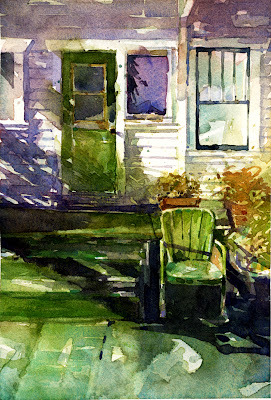 This piece was painted in the first watercolor workshop I took. 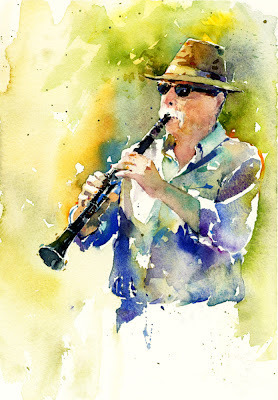 It was October 2011 and fabulous watercolor artist Andy Evansen was the instructor. I would love to take another class from Andy now that I've had more practice. 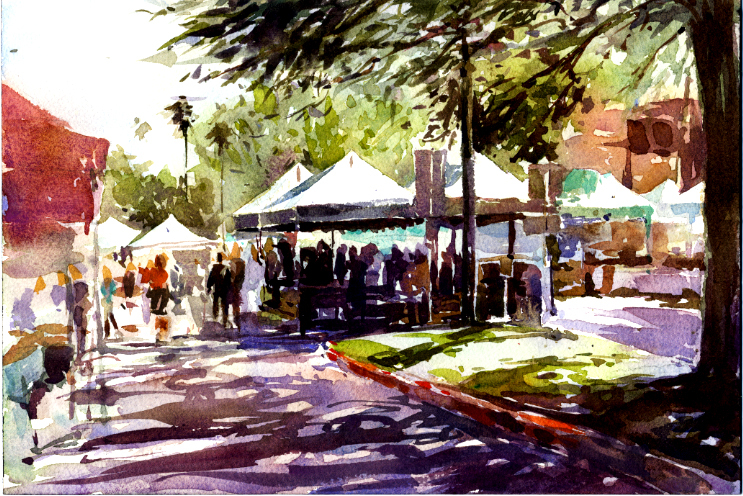 This is the South Pasadena farmer's market. 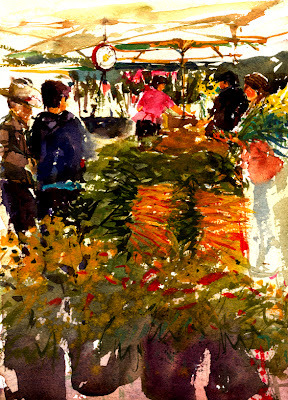 Following the painting is a snapshot I took today at the same market. 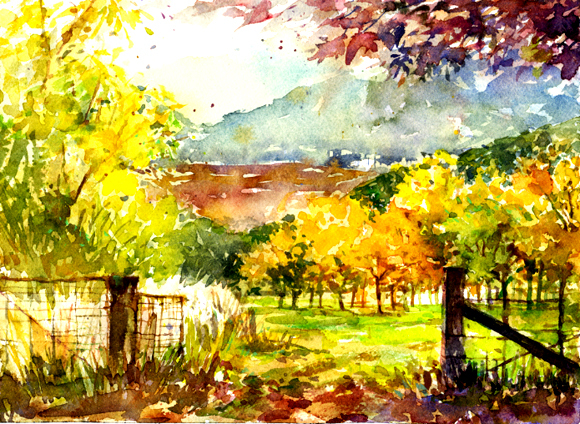 I painted this watercolor in April for a challenge in a Facebook group I'm in. The challenge theme was "edible". My photo reference for this was taken at the Santa Barbara market in 1997. So I never know when the opportunity to use a photo might come up! 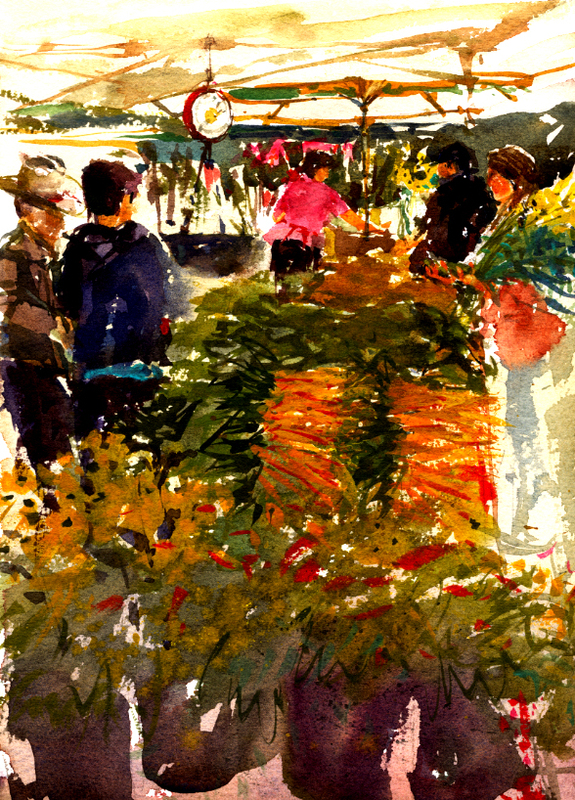 This painting was certainly a challenge with the veggies, people, and perspective. Below it is a photo from the same market that I took a few weeks ago. I wish I could go to that spectacular market every week but it's 100 miles away. 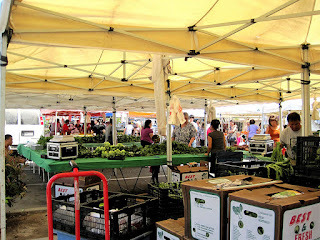 Lastly is a photo from the Alhambra farmer's market that I AM able to go to every week! 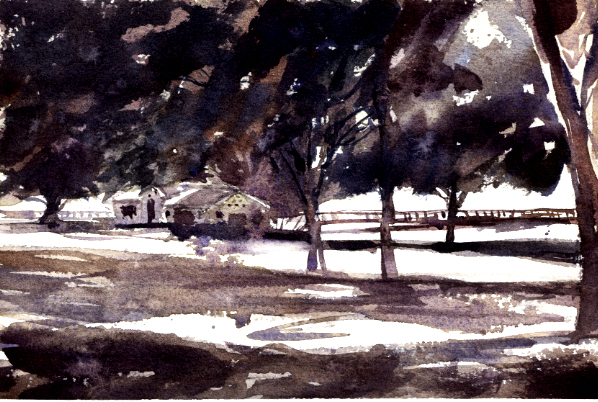 I've been loving my recent plein air paint-outs so much that I started thinking about it a little. My first experience with painting on location was way back in art school...a lot of years ago. I had a watercolor landscape painting class on Fridays. We met at various locations around the Los Angeles area from the mountains, to downtown, to the ocean. I enjoyed painting outdoors a lot. Over the years I tried to find out about local paint-outs but was unsuccessful until I took a workshop from Brenda Swenson. She mentioned the group that I'm now joining on Thursdays. What a revelation it was to me! I was so excited to go painting with the group. It turns out they've been meeting since 1991. I'm a little late but enthusiastic! In March I met the group for my first plein air painting experience since the art school class many years ago. The location was a private home overlooking the arroyo in Pasadena. Oh My. It was a beautiful day and view. "The View" is of two well-known Pasadena landmarks, the Colorado Street Bridge and the Vista Del Arroyo Hotel, photo below. Being my first paint-out experience in a long time I was overwhelmed with the view and didn't know how I would paint it. 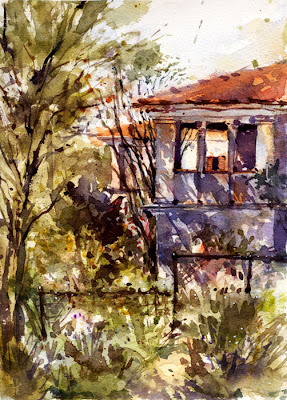 So, I chose a view of of the neighbor's house which had some gorgeous shadows and trees. Here is my painting, my view, The View, and some of the group I was so excited to finally find out about. Below is the view I'll try next time! This group gets many artists attending, painting in both watercolor and oil. Just a few of the pieces from the day. For the past few years we've enjoyed some very pleasurable visits to San Pedro. It's an active waterfront area, the Port of Los Angeles. There is a beautiful, updated marina which is a treat to walk around. It's also the home of the National Watercolor Society headquarters. The gallery shows there require a visit. Averill Park is on a hilltop and features a winding block-long stream and duck pond. I take a lot of photos in San Pedro, hopefully for future paintings. 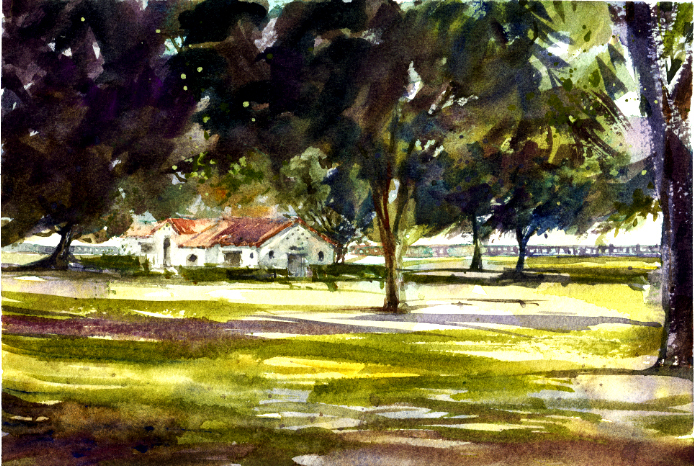 Of course better than painting from my photos is plein air painting on the spot. The plein air group I go out with on Thursdays has met in San Pedro twice this summer and my two paintings are below. Last week we met at the Point Fermin Lighthouse. Since I had been there before, I had in mind to paint a view from the point looking north along the coastline of the beautiful ocean and cliffs topped with structures and trees. Standing to paint that view was just too windy and cold that morning. 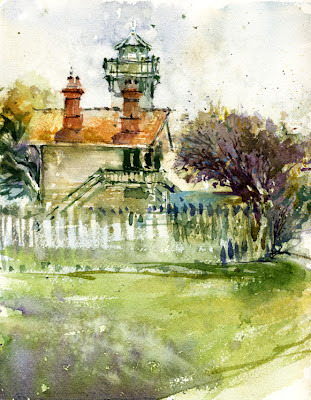 So, I changed my plans and painted a view of the lighthouse with two friends, Nancy and Phyllis, from under a big tree. The lighthouse was built in 1874 and not lit since the blackout along the coast after Pearl Harbor. It is now restored and open to the public for tours. 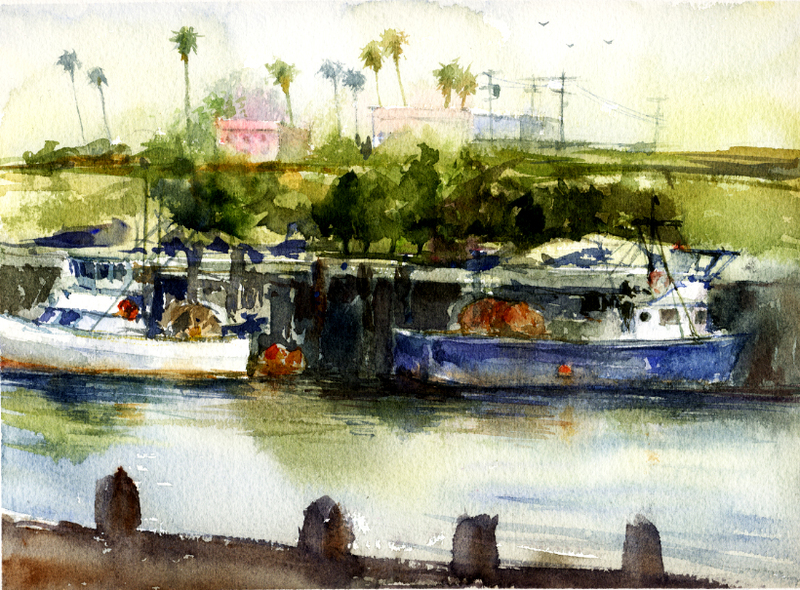 The piece below was painted in June when the plein air group met at Ports O' Call in San Pedro. This area of the waterfront features a tourist spot along a busy channel with all kinds of boats passing by - cruise ships, fire boats, tug boats, etc. My painting friends were mostly situated along a side channel which was where a lot of maintenance work was being done. I finally found a little shade next to a huge dumpster and set up there. It was a beautiful day and my first experience painting at the coast. I hope to paint there many more times. Meanwhile, my friend Terry Freemark added a comment on my previous post of the "found" vacationing ladies photos in "Summer Trips~" asking if I might paint them! This was a surprise to me since it hadn't entered my mind. Terry has painted many watercolor portraits from black & white photos and hers are really wonderful. Hmmm. What occurred to me was possibly painting some of the "found" photobooth snapshots I've come across over the years. I've added some good ones below. They are very small, 1.5" x 2", kind of hard to see detail. I probably couldn't improve on the look of these. So cool. 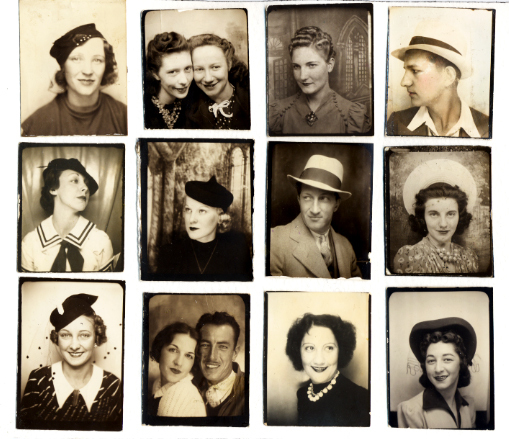 It was last August that I found out about the wonderful website Paint My Photo, Where Photographers and Artists Meet. The website was created by Roy Simmons for the purpose of sharing reference photos to be used for artwork without copyright worries. It is such a helpful site. I like uploading some of my photos that I think artists might like to paint from. And I can also add my own artwork to the site if it was painted from one of the photos available there, which is over 32,000 at the moment. One of the fun things is a themed monthly challenge. I seem to do well with some inspiration and a deadline. One thing I'd like to add is how exciting it has been to get to know new friends from all over the world in these online groups, workshops, websites, and this blog! Here are the first two paintings I did for the August, and September 2011 Challenges, from photos posted on the site. 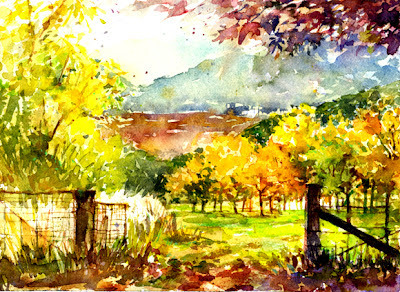 This painting was from a photo of a grove in Bright, Australia by Robyn Lovelock. This small boat harbor in Lake Garda Italy was painted from a photo by Oggy. This was my first try at water with reflections and I found it went better than I thought it might. It has been so hot here this past week that I wish I could have a nice get-away to some cool vacation spot. 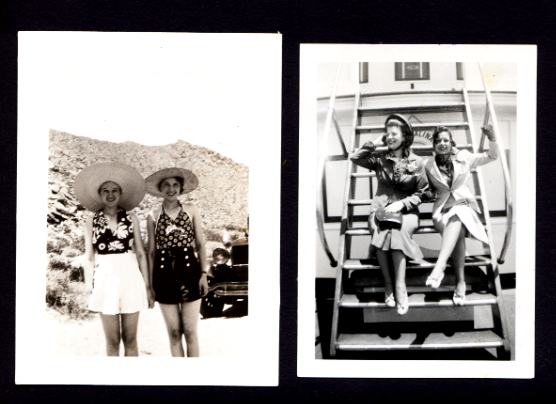 The heat wave has reminded me of these two vintage snapshots of ladies taking summer trips. Two are all set to visit the island of Catalina. But the other two are off to the California desert. Hmmm. Maybe it was a cooler summer that year. 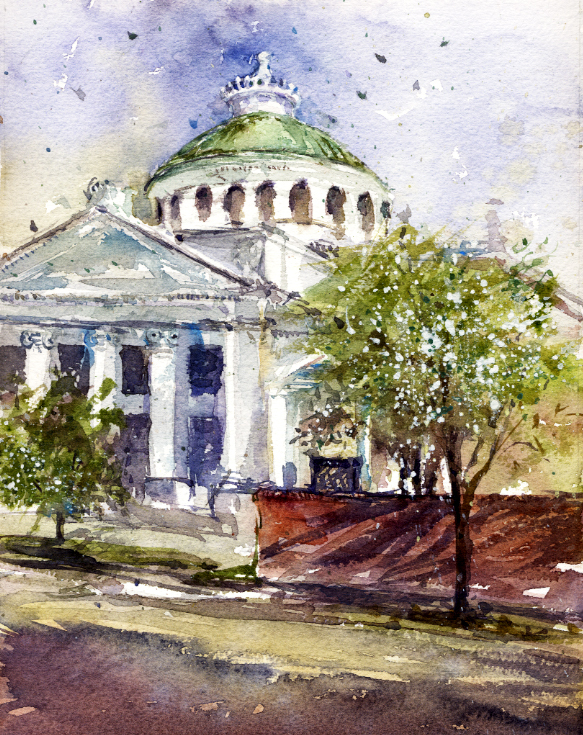 The Saturday plein air group met this morning at the First Church of Christian Science in Pasadena. The church was completed in 1909 and is spectacular with a central copper dome topped with a white crown. It is located on a beautiful tree-lined street with neat vintage buildings. I thought I might end up painting a street scene but there was construction going on there. We all ended up painting the south facade of the church. I noticed a few white crepe myrtle trees and remembered some fun and splattery trees Alvaro Castagnet painted in the workshop I took. Why not try the white church with the white crepe myrtle trees! I'm also including a photo of my view (from under the tree!) in the opposite direction which I was tempted to paint. I really like painting palm trees. Maybe I'll try painting this view sometime. Thinking back to March, I remembered another watercolor that specifically dealt with greens! I had forgotten about this piece and it turned out to be a favorite. I think that's because of the wonderful color combination of greens with purples. A "Green" challenge was chosen for our March project in a Facebook group I'm in. This scene was my choice to try for our casual "challenge". 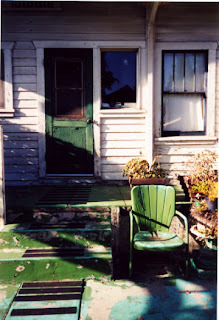 It's from a photo I took with my film camera in South Pasadena many years ago, posted below. I'm a little sad about the view since it's not there any longer. 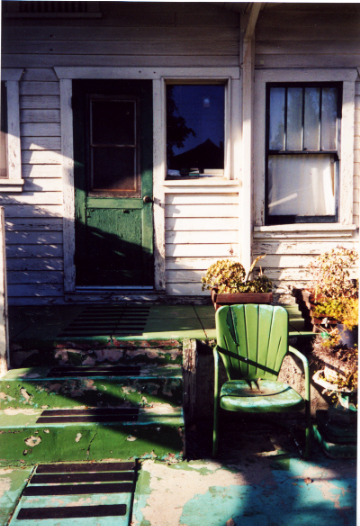 Soon after I took this photo and a few others, the cool green chairs disappeared. I hope they have a good home. This painting was a little stressful while being painted since all the lines were getting confusing. But I like the end result, and another try at it might be fun. The online Going Green workshop that Vinita Pappas taught is ending. She gave instructions for our final projects. These paintings were our choice and Vinita gave us some excellent and fun tips to help us think about what we would like to paint. I had several of my own photos of landscapes I wanted to try, using some of the new greens from our previous week's work. Vinita also wanted us to start with a value painting done in neutrals, mixed neutrals, not out-of-the-tube grays. 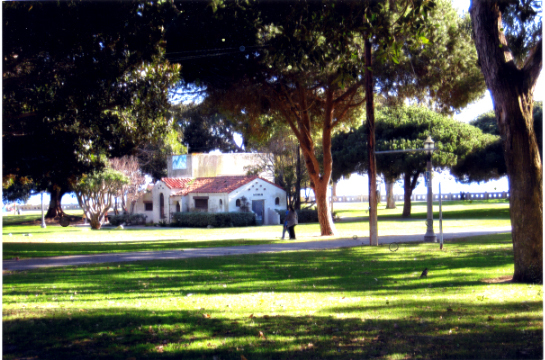 The view I painted is the park at Point Fermin which is around the lighthouse area in San Pedro. Always beautiful light there I think. So here is my painting, my photo and my preliminary value painting. 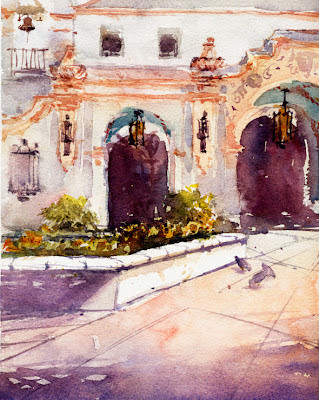 The Saturday plein air group met at La Casita del Arroyo in Pasadena yesterday. The building is a special place on the edge of the Arroyo Seco. It was finished in 1933 after years of planning by the Pasadena Garden Club. Architect Myron Hunt designed the building as a small community meeting place. For building materials, boulders from the arroyo were used as well as wood salvaged from the 1932 Olympic Velodrome which was built in the nearby Rose Bowl for the bicycle races. Native trees, shrubs, and wildflowers are a beautiful part of the grounds. It started as a hazy morning, the sun came out, and we had fun painting at the location. 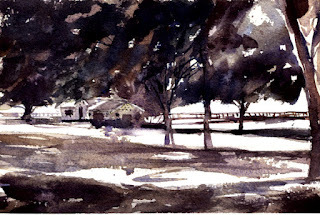 There was also another plein air group on a paint-out from Antelope Valley which is quite a drive away. 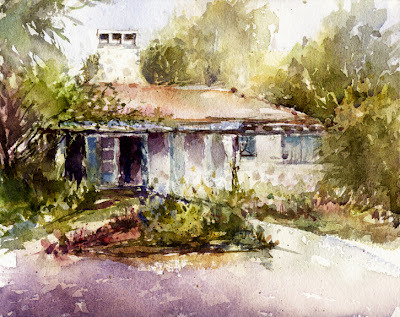 The Casita had been rented for a birthday party so we painted through lots of deliveries. We were finished by the time the party was to start at 12:30. I've included a couple photos of the building as well as the view from there of the historic Colorado Street Bridge (1913) which I hope to paint in the future. To me La Casita always has sort of a soft look since it has the off-white exterior walls, pale blue trim, and lots of airy plantings near it. This is 8" x 10". Our Thursday plein air group had the option of going to Exposition Park near the Coliseum where events for the 1932 and 1984 Olympics were held here in Los Angeles. Or, we could try Eaton Canyon in Pasadena, a nature preserve next to the mountains with hiking trails. 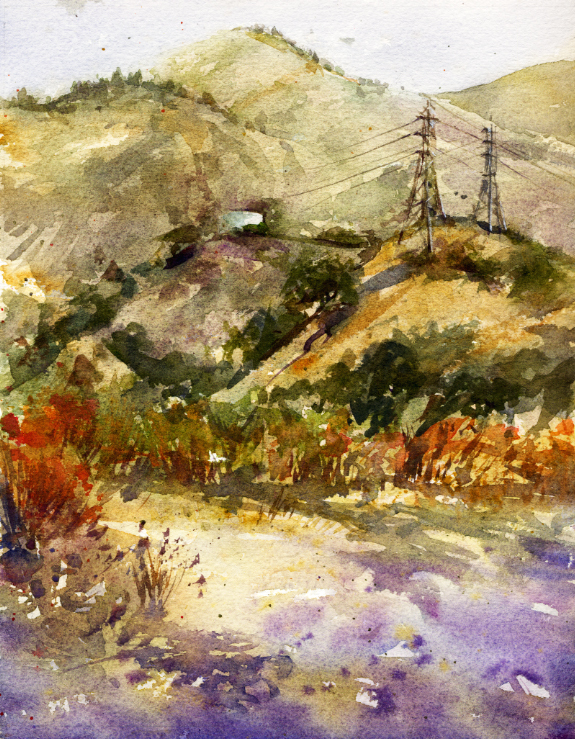 I want to paint at Exposition Park where there is an extensive rose garden, but for today I chose Eaton Canyon. Last time we painted there I wasn't happy with my result. After I finished I noticed some chickens, and wanted to check out the area again. The chickens are still there, photo below, but I didn't paint them today. I heard they are there for West Nile virus monitoring. I chose a view of the transmission towers. They seem to be in most views there and I like what they add to a painting. I'm pretty happy with the way this piece went. This was my view. I don't know what the red bushes are which are going to seed but they were very colorful. Mission Playhouse in San Gabriel, CA was the location for the plein air group on Saturday. It's a beautiful building, dedicated in 1927, and located next to the San Gabriel Mission (1771). For quite a few years it was known as the San Gabriel Civic Auditorium, but is now back to its original name. To me the architecture seems very unusual and has lots of beautiful features and details, colorful tiles, and chandeliers. While it's a pretty building, I thought it was difficult to paint. During the few hours we spent there the light and shadows on the building seemed to change by the minute. I'll add a couple of photos of it here. Maybe I'll try the fountain next time. I always learn something and have fun painting with my friends. This old box office is such a beautiful accent. I added it to my painting.